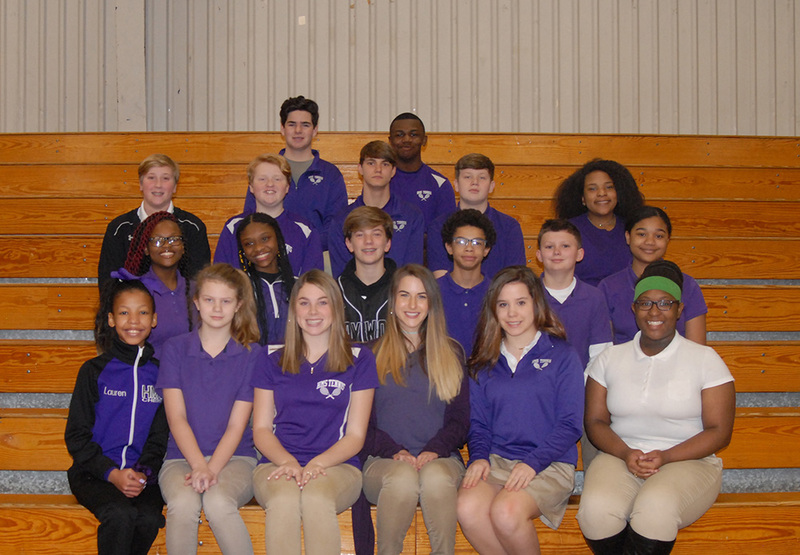 Members of the 2019 Haywood Middle School Tennis Team are Lauren Jarrett, Rachel Deck, Molly Nichols, Karleigh Howard, Abbey Berry, Rania Cole, Sadaja Jeter, Ja’Mya Woods, Jeb Banks, Matthew Blaylock, Landon Chapman, Hailey Cunningham, Ashton Doyle, Miller Lee, Eli Walls, Tyler McCord, Katherine Jackson, Reed Sullivan and Jamarius Reed. Coaching the team are Jessica Neal and Jane Jameson. 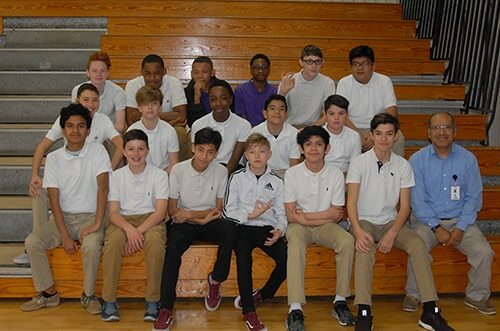 Members of the HMS 2019 Soccer Team are (from left, front) Kayleb Catalan, Ethan Rikard, Jordan Head, Josir Garcia, David Catdan; (2nd row) Luke Sullivan, Cristhofer Ocegveda, Danny Parker, Christopher Ramero, Kalen Carmona, Steven Lewis; (3rd row) Japheth Sanchez, Kavnais Fields, Julius Stewart, Abraham Cruz, Antonio Sanchez; and (4th row) Alexander Medina and Smith Berry. 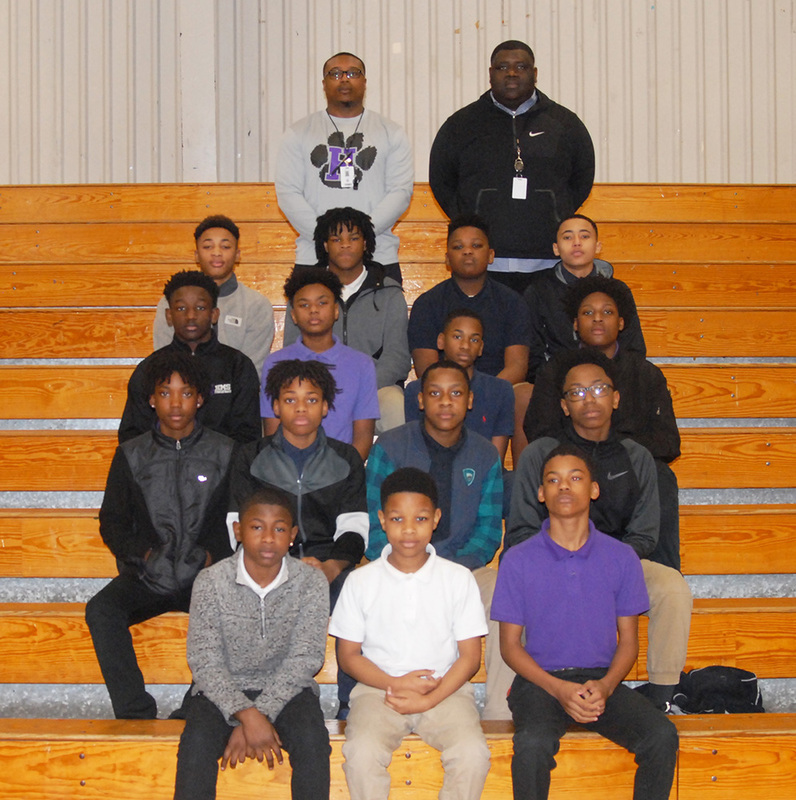 Members of the Haywood Middle School Boys track team are, Camrion Shaw, Kevin Reid, Isaiah Priddy, Brison Green, Antwan Bond, Dayton Reid, Julian Douglas, Ryan Thomas, Isaiah Torrence, Jalen Currie, Elijah Bond, Zion Washington, Jordan Johnson, Bishop Owens, and Elijah Fauteux. Coaches are Vernon Mann and Xavier Clay. 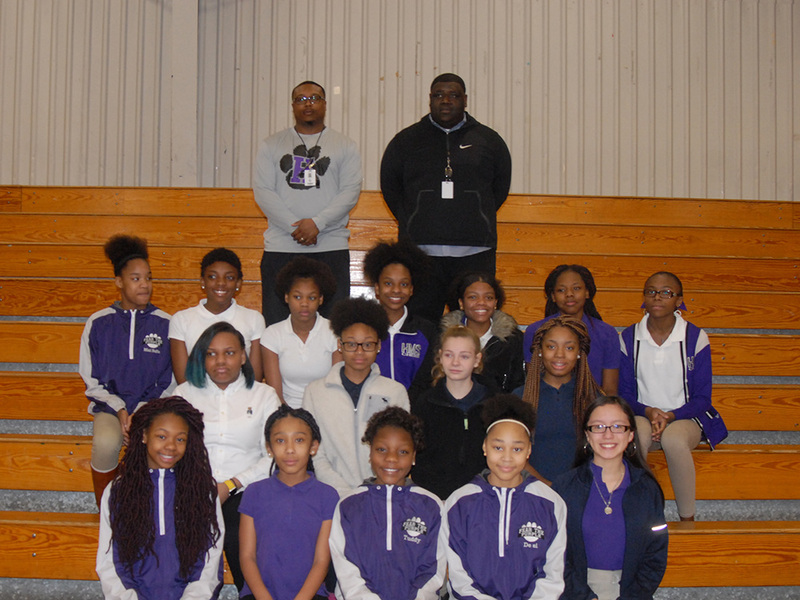 Members of the Haywood Middle School Girls track team are Arianna Jarret, Keymiah Walker, Ashunte’ari Alford, Desirae Reid, Andrea Reyes, Lakyia Boyd, Jeriah Henderson, Liberty Johnson, Jeterica Champion, Kiarla Turner, Maliyah Brand, Jakaya Young, Latia Hines, Megan Garrison, Daltaysia Ballard, and Asia Silas. Coaches are Vernon Mann and Xavier Clay. 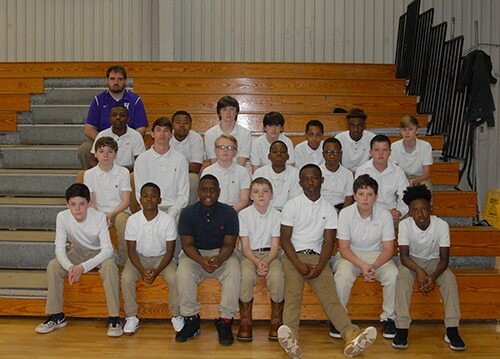 Members of the 2019 HMS Baseball team are Detavious Musgraves, Xavion Miller, Austin Parnell, Deandre Hines, Kobe Wilson, Keyonis Musgraves, Owen Stanley, K.K. Fields, Drew Leek, Jessie Scott, Cordarion Jelks, Amare Martin, Cordero Walker, Lamar Currie, Keyvion Musgrave, Jeb Banks, Cam Barr, J.T. Byrum, Nathan Neal, Julian Jarrett, and Jamarius Reed. The team is under the direction of Coach John Wilson and Coach Jonathan Ferrell. 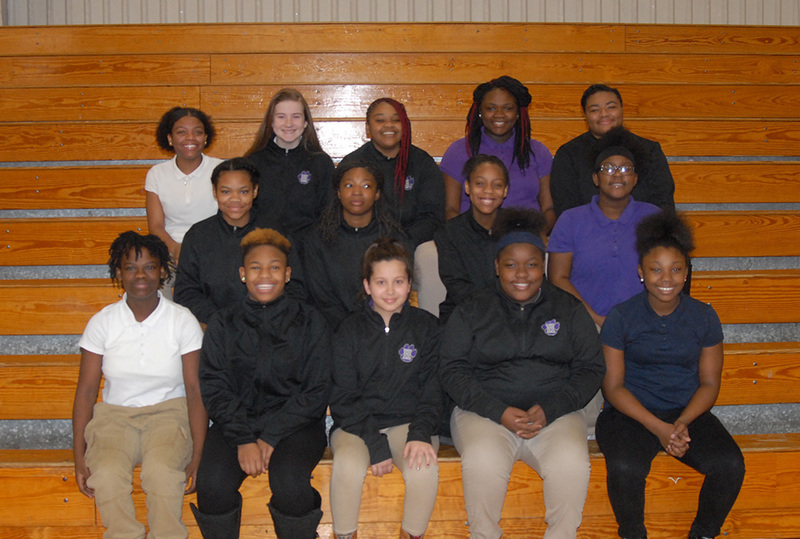 Members of the Haywood Middle School Softball team are Lillian Scott, Kayla Simpson, D’Andria Byars, Emmalee Smith, Brynn Currie, Crisslyn Howard, Diamond Ballard, Mya Mullins, Taniya Douglass, Taliyah Miller, Key’Anna Buck, Ja’Kyra Tate, Le’A Douglas, Madelyn Tims, T’Niya White, Travica Pugh, Deniya Wilson, LaKyia Boyd, Megan Garrison, Leighanna Baker, and Cynthia Kennedy, Cinyah Dotson, Alex Baird, Emilee Stowe, Coach Joseph Doles, Assistant Coach Melissa Doles, and Assistant Coach T. Shaw. 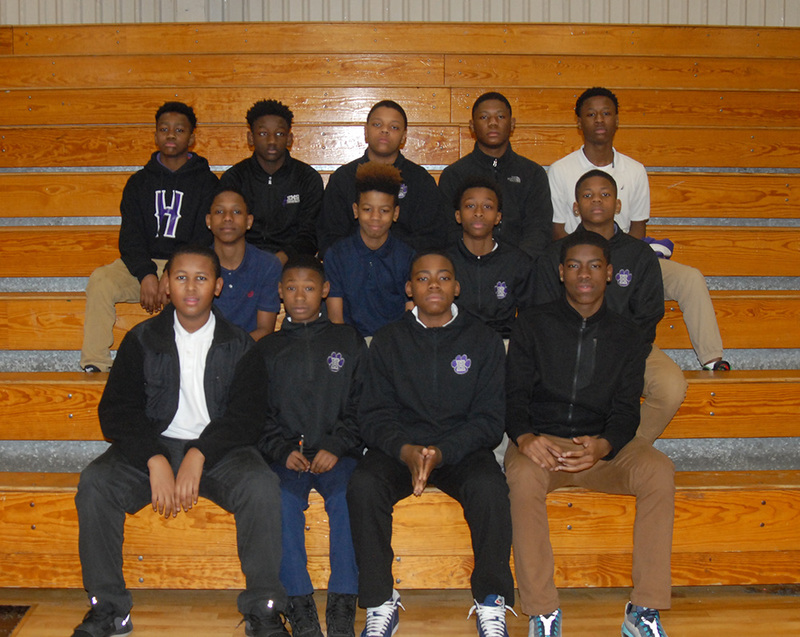 Members of the Haywood Middle School Boys Basketball Team are Cordero Walker, Brison Green, Jamari Person, Tylon Chatman, Mekhi Seamore, Jullian Jarrett, Cortavious Mortan, JaMarrion Russell, Shylon Madyum, Tremayne Lee Chris Sanders, Kevin Davis, and Jacari Comage. Not pictured is Janerus Snipe. Coaching the team is Jason Winfrey. 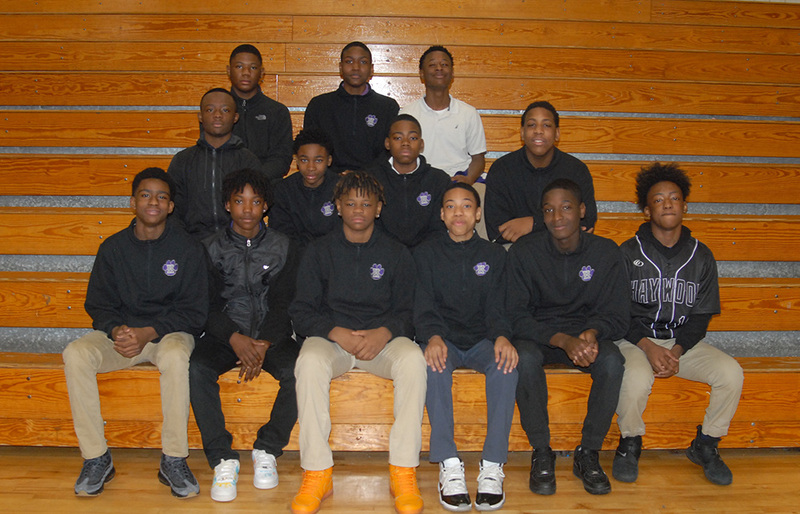 Members of the Haywood Middle School Boys Junior Varsity Basketball Team are Jeffery Parker, Michael Tyus, Shylon Madyum, Zikeyous Fortune, Trey Boyd, Kanih Comage, Lekendric Watkins, and Jaybon Snipe; Keyonis Musgrave, Ryan Edwards, Caden Pirtle, Chris Sanders, and Jacari Comage. Jason Winfrey is the coach for this team. 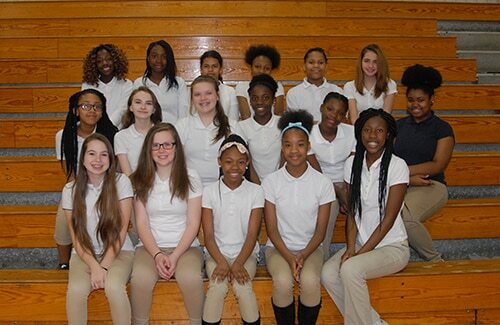 Members of the HMS Girls Basketball team are Shakira Taylor, Sheronica Wilks, Kayla Simpson, Jameika Lewis, and Taylor Bobo, Azaria Taylor, Natalia Brice, Martashia King, Key’Anna Buck, Megan Garrison, Macie Ferrell, Martasia McDaniel, Akeyla Harris, and Alana Perkins. Jason Winfrey is the coach for this team. 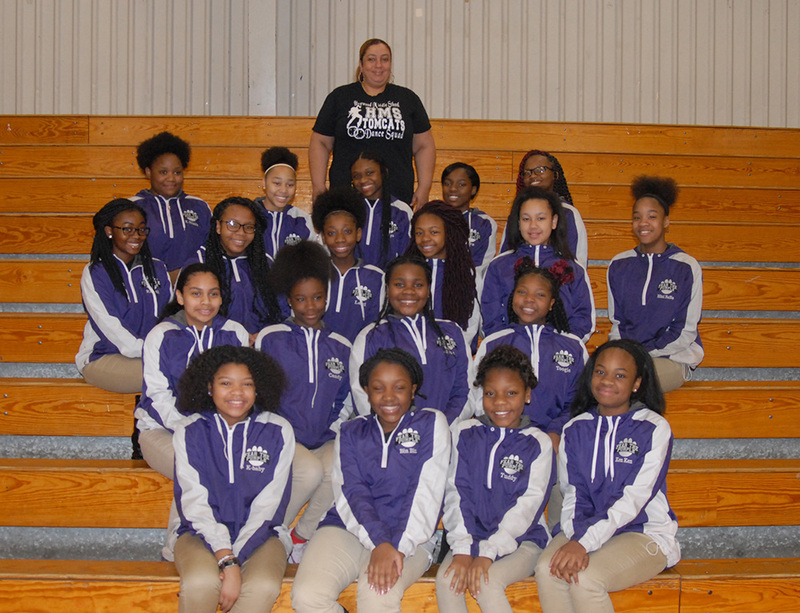 Members of the Haywood Middle School Basketball Cheerleading squad are Michelle Bradford, Trinity Shaw, Symone Muex, Lamiya Smith, D’Asia Musgrave, Aniya Estes, Lauren Jarrett, Makharia Tyus, Taliyah Miller, Gabbie Commage, Lataejah Franklin, Abbie Sensabough, Tamaya Stewart, Alexis Coulston, Kayla Berry, Markecia Bolton, Latiah Hines, Markayla Jones, Lakyia Boyd (Captain), Tykia Currie, Ashley Goff, and Cierra Mack. Coaching the squad is Flamesha Taylor. Members of the Haywood Middle School Pom Squad are sixth graders Karly Young, Binta Keita, Ashunte’Ari Alford, Kennedy Rhodes, Kamia Somerville, Candace Bradley, Jade Taylor, and Gerrica Byars, seventh graders Co-Captains Khadi Keita, and Christine Michael, Alexis Seymour, Arianna Jarrett, Cierra Runions, Kiarla Turner, eighth graders Keywanna Taliaferro, Desirae Reid, Captain Ja’Mya Woods, Makya Sims, and Sadaja Jeter. Coach is Kimberly A. Bell. 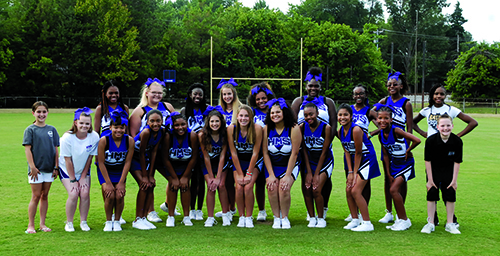 Members of the 2018 HMS Tomcat football cheerleaders are Alex Baird, Aysa Smith, Asia Silas, Brianna Tatum, Brooklyn Muex, Cierra Mack, Grace Cavitt, Ja’Kyra Tate, Kayleigh Howard, Lakyia Boyd, Markayla Jones, Molly Nichols, May Hughes Rikklia Taylor, Akeelah Harris, Alexa Leon, Harrison Davis, Jordan Conner, Kristian Reid, Lauren Jarrett, and Martha Carpenter. Not pictured is Nyia Rogers. HMS teacher Cindy Currie is the sponsor. 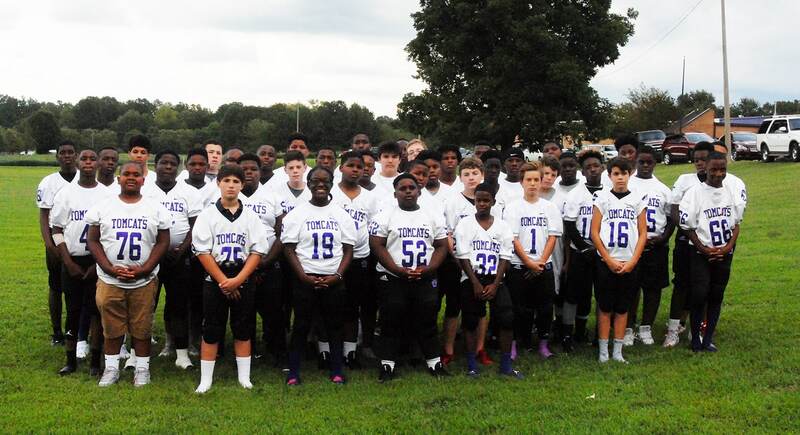 Members of the HMS Tomcat Football team are Anthony Hendrix, Cam Barr, Cassidy Thomas, Christian Lawrence, Christopher Branch, Collin Douglas, Cortavious Morton, De’Aundria Robertson, Detavius Musgrave, Jamarious Reed, Jeb Banks, Jordan Johnson, Julian Jarrett, Kaytevious Holmses, Keshawn Musgrave, Kevin Davis, Kylan Brown, Luke Fisher, Marliss Gray, Odis Shaw, Shylon Madyun, Timtarious Allen, Willie Parker, Bishop Owens, Braden Parrish, Chris Sanders, Cordero Walker, Devin Moore, Elijah Fautux, J. T . Byrum, Lecedric Jarmon, Tanner Moore, Timothy Owens, Willie Benard, Zi’Keyus Fortune, Deandre Hines, Luke Sullivan, Omarion Sweet, and Owen Stanley. Head Coach is Vernon Mann and Assistant Coach is Xavier Clay. 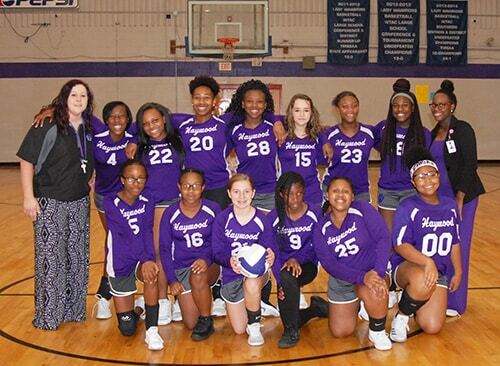 Members of the 2018 Haywood Middle School Volleyball team are Cinyah Dotson (#28), Zaria Meadows (#00), Travica Pugh (#4), Maggie Robinson (#21), Lakiya Boyd (#22), D’Asia Musgrave (#5), Aisatu Camera (#23), Ta’Curia Lewis (#9), Kalyce Mitchell (#20), Cidney Pearson (#25), Jania Brown (#16), Emilee Stowe (#15), and Deniya Wilson, (#18). Head Coach is Melissa Doles, and Assistant Coach is Ashauna Hines. 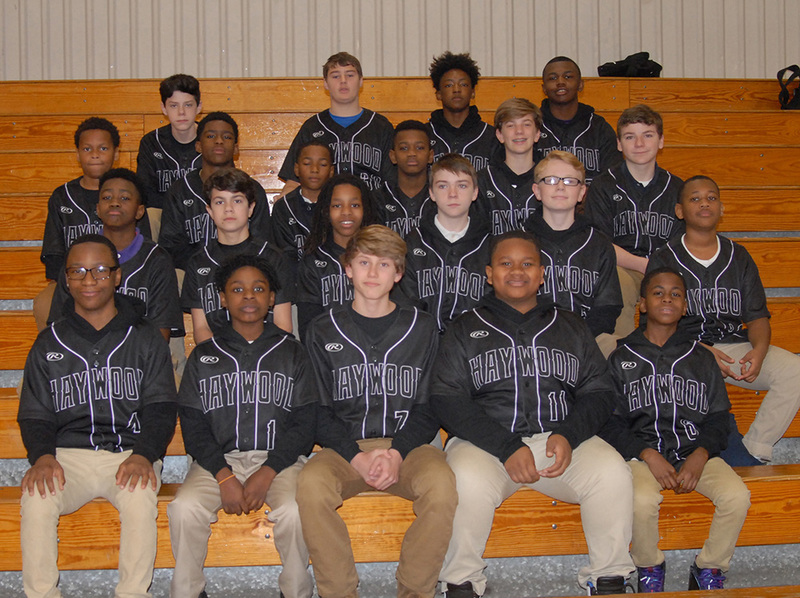 Members of the 2018 Haywood Middle School Baseball team are (30) T. Byrum, (21) Christian Lawrence, (8) Ardion Watkins, (2) Drew Leek, (4) Cortivous Morton, (12) Tanner Moore, (42) Julien Jarrett, (22) Cam Barr, (17) Dalton Jones, (5) Jessie Scott, (3) Shylon Madyun, (6) Detavious Musgrave, (45) Hayden Jeter, (15) Jamarious Reed, (37) Alvion Pugh, (14) Zach Pittman, (18) Christopher Swalm-Rodriguez, (20) Jaylin Williamson, (23) Jayden Jackson, and (0) Austin Parnell. Not pictured are (10) Andros Simmons and (7) Eli Walls. Head Coach is Sam Pyron and assistant coaches are Vladimir Valdez and Jonathan Ferrell (not pictured). 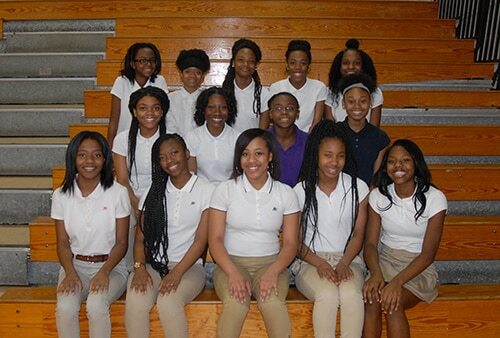 Members of the HMS Junior Varsity team are (from left, front) Makya Moss, Leighanna Baker, Arianna Jarrett, Kiaria Turner, and Travica Pugh; (second row) Kayla Berry, Vanessa Littlejohn, Jennifer Moses, Morgan Fuller, Madison Green, and Jeremeah Shaw; and (third row) Jakyra Tate, Tanyia Rogers, Mya Mullins, Tiarria Gray, Jakyla Hughes, and Cynthia Kennedy, manager. 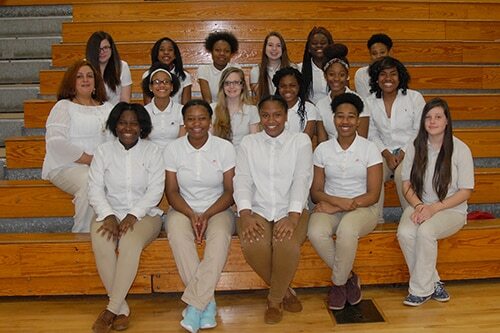 Members of the HMS Varsity Softball team are (from left, front) Kabreya Benton, Mecasia Taylor, Aaliyah Cunningham, Kalyce Mitchell, Kelly Murphy; and (second row) Camoni Turner, Tabitha Cook, Cierra Mack, Destaynee Hammond, and Briana Zuniga; and (third row) Josey Hershey, Faith Russell, Tiarria Gray, Makya Moss, Jokeya Springfield, manager, and Martasia Robertson, record keeper. Head Coach for both teams is Kimberly A. Bell, and Assistant Coaches are Jarrell Bond and Patrice Boyd. Not pictured is Tamia Henley. 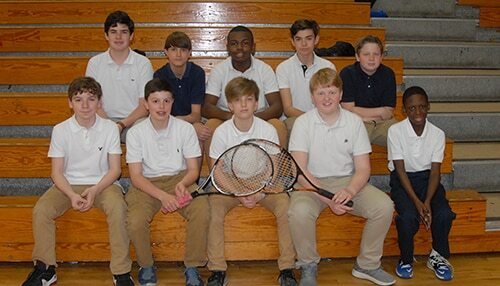 Members of the Haywood Middle School Boys Tennis team are (from left, front) Cam Barr, Jack English, Jeb Banks, Miller Lee, and Dyelin Grandberry; and (second row) Reed Sullivan, Eli Qualls, Jamarius Reed, Reid Russell, and Tyler McCord. Coach for the team is Jane Jameson. 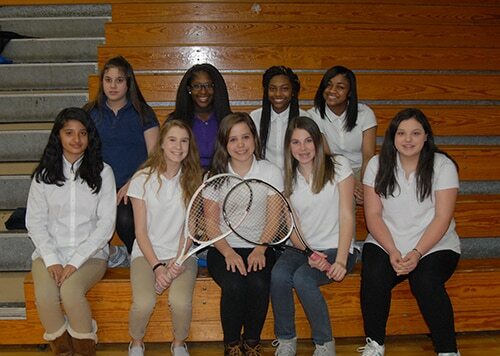 Members of the Haywood Middle School Girls Tennis team are Beneza Sandoval, Makayla Newman, Abbey Berry, Molly Nichols, Madison Moore, Olivia Milton, Rania Cole, ShaDalice Price, and Shamariah Houston. Not pictured is Martha Carpenter. Coach for the team is Jane Jameson. 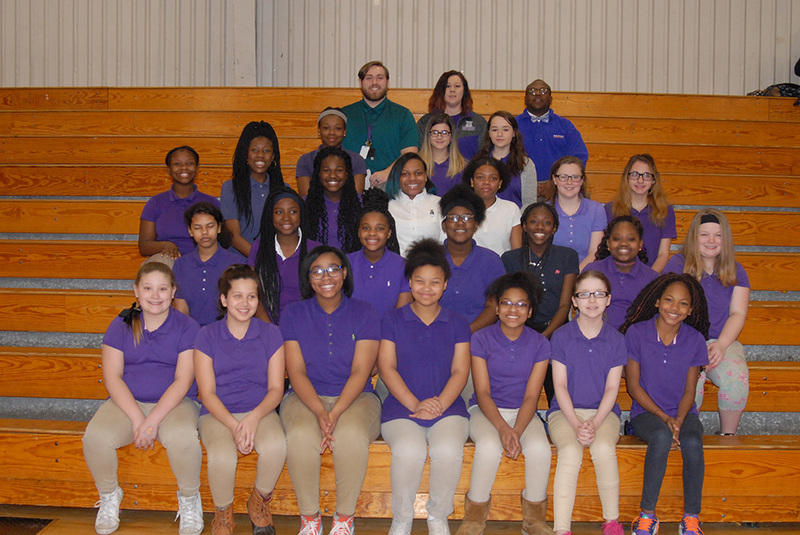 Members of the Haywood Middle School 2018 Girls Track team are (from left, front)Victoria Reed, Makenzie Hawkins, Joniya Starks, Tamya Clark, and Diqtaysia Ballard; (second row) Megan Garrison, Makayla Ward, Asia Silas, and Jariyah Henderson; and (third row) Jaleah Beard, Kyla Spencer, Jaderika Welch, Shinya Comage, and Latia Hines. 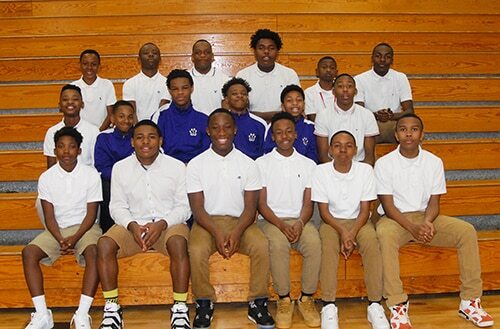 Members of the Haywood Middle School 2018 Boys Track team are (from left, front) Brison Greer, Sedarius Palmer, Jakylon Taylor, Kaleal Lawrence, Kadarion White, and Monterion Woods; (second row) Malik Manns, Jaylon Currie, Jordan Johnson, Mondarious Turner, Keith Warren, and Jaylen Lewis; and (third row) Termerril Thomas, Cortavious Morton, Antavious Springfield, Camron Douglas, Camarion Shaw, and Akyrn Trill. Head Coach is Xavier Clay, and Assistant Coach is Vernon Mann (below). 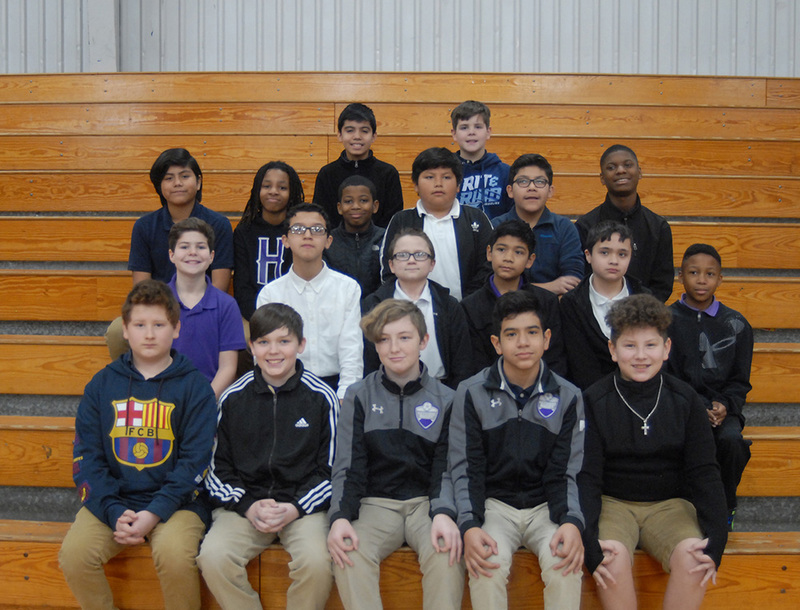 Members of the 2018 Haywood Middle School Soccer team are (from left, front) Gabriel Carranza, Jack English, Allan Morales, Jacob Inman, Osvaldo Rodriguez, Reid Russell, and Coach Humberto Aguilar; (second row) Walter Smith, Jeb Banks, Trever Williams Jasir Caletre, and Moises Martinez; and (third row) Sid Vandiver, Anthony Brewer, Zachary Gallardo, Trenton Evans, Jacob Eubanks and Manager Gerardo Ramirez. Not pictured are Sam Corman and Jordan Head.